Mazzini sounds like an Italian tire brand, but it is marketed by a large Chinese company called Best Choice International Trade. This company markets several other brands, such as Goodride, Linglong, Autogreen, Delmax, Sunew, and Grenlander. Within the Mazzini brand, they have several tire models like Cruise, the ECO, Giantsaver, Mud Contender, Road Legend, and the Snowleopard. For now, we have not found many reviews of the brand. We would prefer to go with the tried-and-true tires on our Best Tires by Category list first. 4 out of 5 based on 5 user ratings as of 4/1/18. The ECO607 is offered in sizes from as small as 195/50R15 all the way up to a whopping 305/35R24 size. It is geared toward All-Season stability and fuel economy. We only found a few reviews which state it is an acceptable tire for inclement weather up to light snow. 3 out of 5 based on 9 user ratings as of 4/1/18. 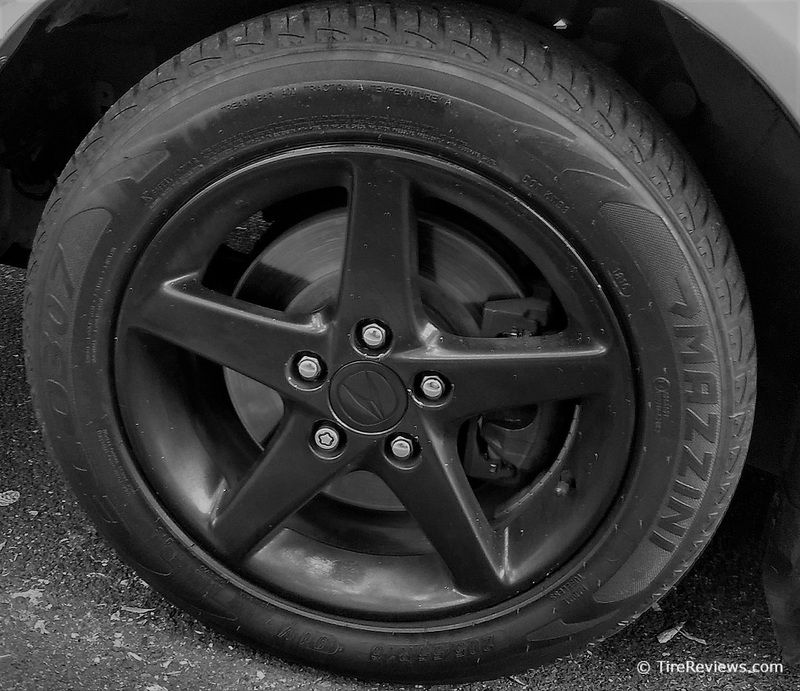 The ECO307 is a smaller car tire for sizes from 13-16" rims. Reviews are just average - we think a much better discount tire can be had in the Milestar MS932. 3.5 out of 5 based on 4 user ratings as of 4/1/18. The ECO605 Plus is offered in multiple sizes covering rims from 14-19". Mazzini designed this tire to have good wet handling and performance. However, we could not find many reviews of this tire to corroborate its performance. 4.5 out of 5 based on 4 user ratings as of 4/1/18. Oddly, the manufacturer doesn't market this as a fuel efficient tire, rather it highlights wet traction capability and a quiet ride. N/A out of 5 based on 0 user ratings as of 4/1/18. We could not find any reviews for the Mazzini Snowleopard. For a snow or winter tire, we highly recommend going with one on our ranked Winter Tires list. Pictured below is a Mazzini ECO 307 tire mounted on an Acura. The DOT code of KW indicates it was manufactured by a company called Shengtai in Dongying, China.